The Responsible Art Market (RAM) Initiative is coming to New York! 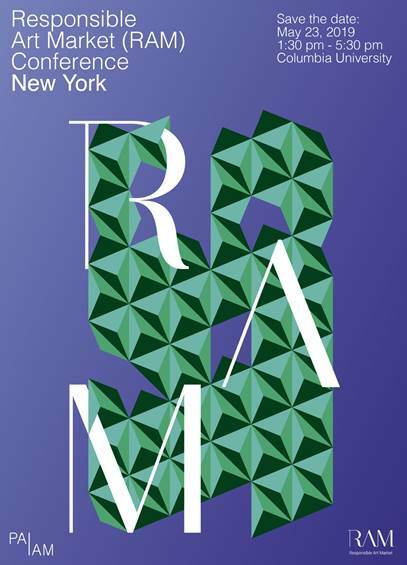 Join us for the first US RAM conference organized jointly with Columbia University and PAIAM. RAM is the first of its kind, non-profit, cross market initiative formed in Geneva, Switzerland in 2015. Its mission is to raise awareness amongst art businesses of risks faced by the art industry and to provide practical guidance and a platform for the sharing of best practices to address those risks. RAM’s founding members span the entire spectrum of the art market and include art businesses, institutions and attorneys. To date, RAM has published two sets of practical guidelines and checklists (downloadable free of charge on its website) which are increasingly used and referred to in Switzerland and Europe: the Guidelines on Combatting Money Laundering and Terrorist Financing and the Art Transaction Due Diligence Toolkit. On May 23, 2019, we invite you to discover more about the RAM Initiative and its achievements. You will also have the opportunity to hear seasoned experts discuss the latest regulatory developments affecting the art market and the practicalities of art transaction risk management. A reception will follow. The conference program and registration details will be available shortly. For more information, please visit RAM’s website at www.responsibleartmarket.org. Media and advertising enquiries can be sent to info@responsibleartmarket.org. We look forward to seeing you at Columbia University on May 23.